Already a member? Please sign in here. Are you feeling like you have no free time? Do you feel you are always running around and don’t have time to disconnect and just be? Maybe you feel you don’t have any free time between work and taking care of the kids. Maybe you think that starting a new activity, while you’re so busy, would be crazy. Maybe you think you have no time to disconnect, let alone learn something new. Maybe you feel that you only deserve to unplug when you are done with your to do list. But let’s face it. That never happens. When you create time to make things with your hands, you feel calmer, happier, more creative and feel a sense of achievement. The air Embroidery Club is a community with embroidery templates that will kickstart your passion for making and make it fit in real life. When you join the Club, you become part of a supportive community of busy people, who share a common passion for making things with their hands. Scroll down to see some of our members’ projects. you feel you don’t have time for anything? you think you’ll only have time to yourself when you retire and kids leave home? you don’t have time to read a book, let alone learn something new? you lead a more satisfying life when you learn a new craft. you get a sense of achievement every time you complete a project. 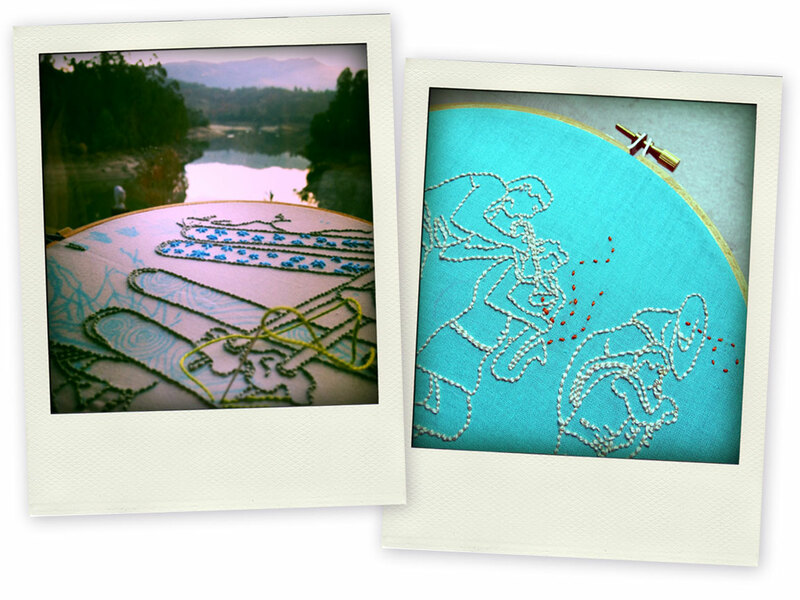 You will realize your embroidery is like a coloring book for adults, where instead of crayons you use needle and thread. 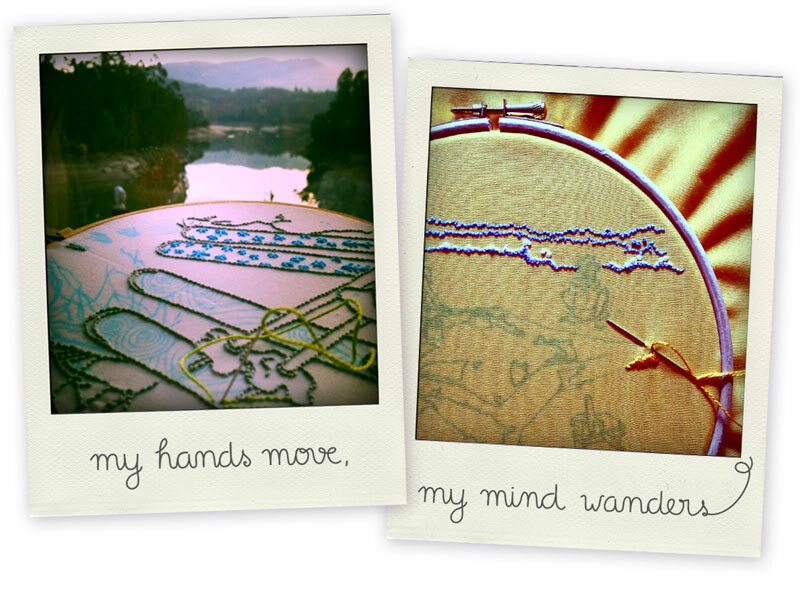 An embroidery project is the perfect companion while waiting for your appointment, it’s inexpensive and very, very fun. You will learn how to create the art you want to have on your walls, with your own hands. My name is Ana Isabel Ramos and I love that my initials spell “air”. I feel this is no coincidence, because one of the first lessons I learnt while studying graphic design was that the white on a page was as important as what was printed. No wonder this has influenced my sketchbooks and illustrations of my life in three different continents, and today it feeds my embroideries too. A few years ago I challenged my notion that embroidery was difficult and found in it a fantastic way to translate into fabric my passion for line drawing. Since that day, I have learned from the Club’s members and shared with them my passion for different embroidery traditions around the world. 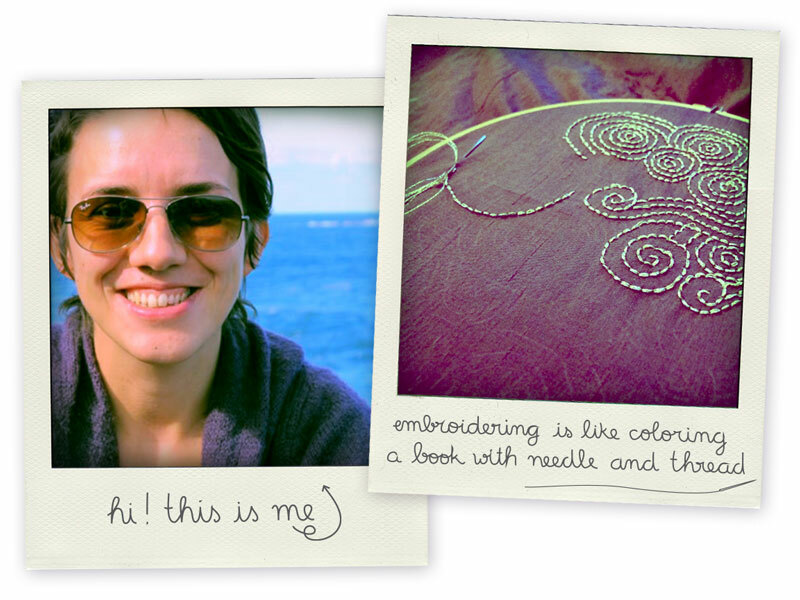 I created the air Embroidery Club because I love the way I feel when I’m embroidering, and I want to share that with everyone. I enjoy myself when I take that time to be focused on one thing only. While I watch my hands move, my mind wanders away. And it is at the moment I’m most relaxed I sometimes find solutions to other problems in my life. 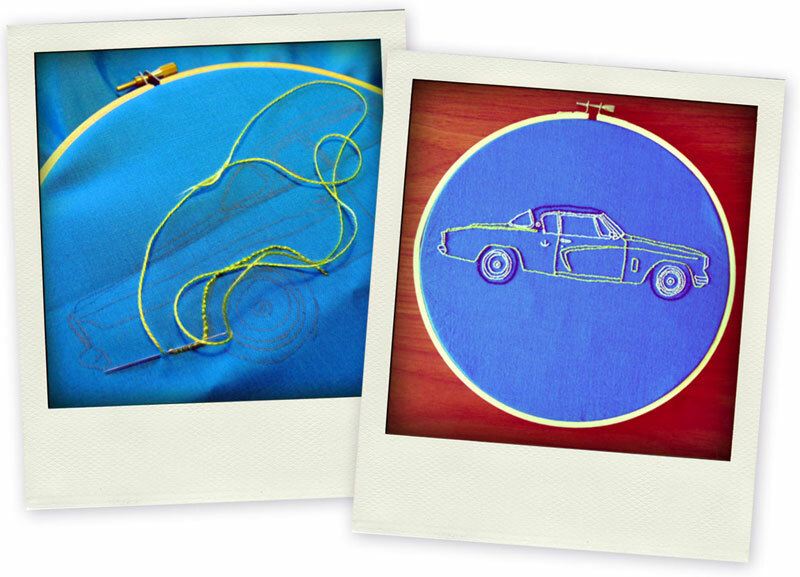 The air Embroidery Club is an online community you can join. Cool, right? 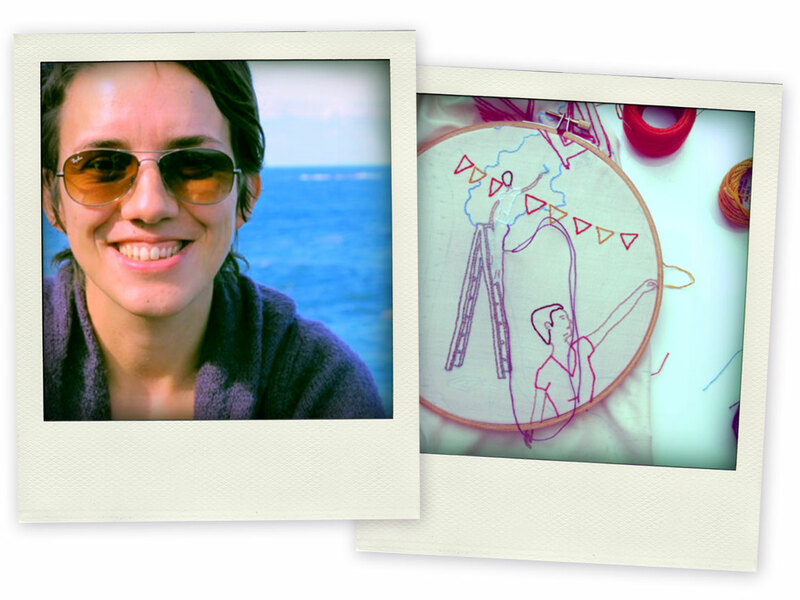 Sign up now to get your hands stitching and your mind relaxing. In two weeks, your first art piece will be proudly hanging on your wall! What supplies shall I use? fabric: after testing many different fabrics, I recommend a basic cotton that could be used as a bed sheet. In your local shop, touch the fabric and try to imagine if this could be used on your bed. If so, that’s the right one. 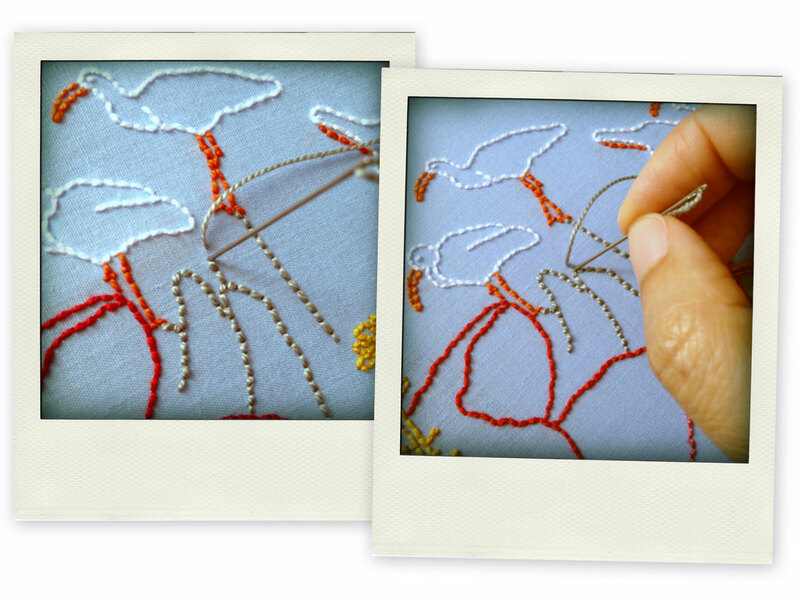 Go for a light color when starting out, so that the transferred embroidery template is visible. hoop: a basic wooden, circular, 7in or 17cm in diameter hoop is ideal for these templates. They’re not to large nor too small and all templates are designed to fit into it. thread: I love DMC Cotton Perlé in size 8, but there are other fine brands in the market. Be sure to choose size 8.
needles: a pack of assorted needles is your best friend. To test the size, use a needle on your fabric and see if doesn’t leave a hole. Now, insert the thread through the eye of the needle. Does it glide easily through it? You found the correct size! marker: I love “Mark-B-Gone” pens because they are easily washable (do not expose marked fabric to sunlight or heat, as this will fix the ink on the fibre of your fabric, becoming unwashable). I know these pens may not be easily accessible, so I also recommend a fabric pencil, usually made of washable wax. Tailor’s chalk may also be another option. Before I bought any of these, I used a soft pencil (3B and up) to transfer the image. Your fabric will need a thorough wash afterwards. I know I’m very busy with life so I like to keep my embroidery on the pleasure side. Projects usually take about three afternoons to complete, but it all depends on your own pace. Yes! Step-by-step instructions will take you from the beginning to the end of the project without hassle. Will there be any language options? Yes: templates will be available in English and Portuguese and are profusely illustrated with photos. I’m new to embroidery, is this for me? Yes! Actually, I wish I had belonged to an embroidery club when I first started. Instructions are detailed and you can always ask any questions you may have. 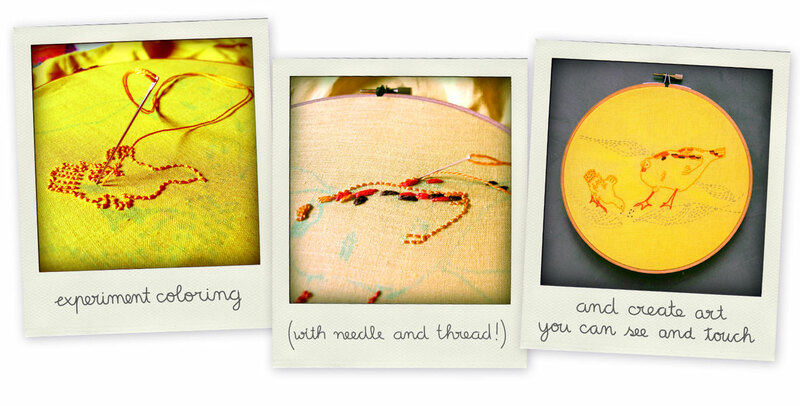 You can also learn to embroider, for free, with my free, fun and fantastic embroidery e-course. Register here. I’m an advanced embroiderer, is this for me? Yes! You can use my design as a starting point and stitch it anyway you like. And that’s fun! I can’t wait to see your projects! It costs nothing to belong to the Club, access the pool of patterns and joining the conversation on our secret facebook group. You don’t need to purchase any pattern to belong to the Club. Patterns will be available for purchase at your own pace, whenever you want to purchase and only if you want to purchase them. Price of supplies depends on brand chosen and where you are making your purchase. The following are estimates only: basic cotton fabric (half yard around 3€), assorted colors of DMC Cotton Perlé (around 4€ per ball), an embroidery hoop (around 8€), pencil or marker (4€). Remember that most of the supplies last for many months! Patterns will be available in the Club’s homepage. Sign up now. 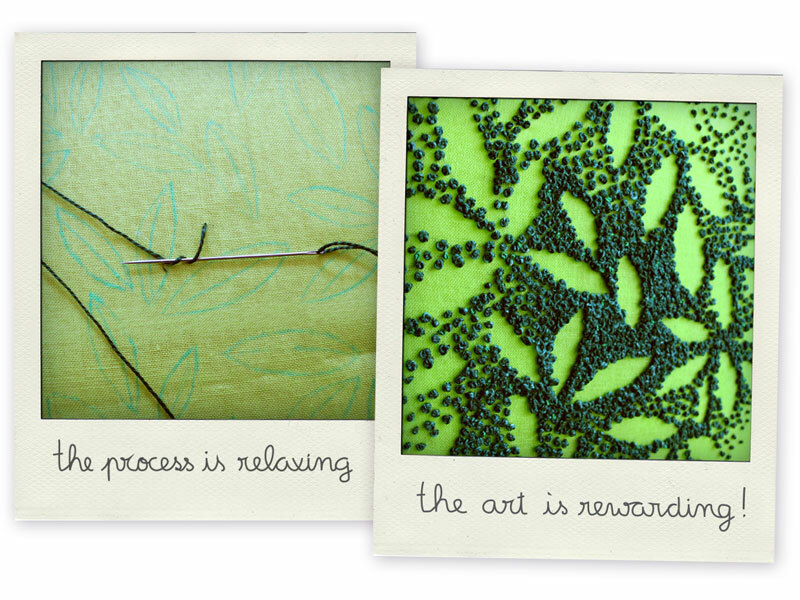 Ready to start relaxing while making your own art? 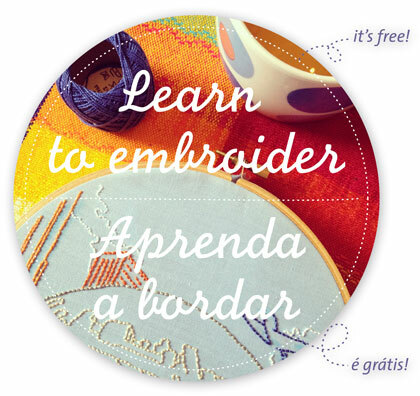 Join now and hang your first embroidery project in just one month!